For our two nights in Zurich I transferred 44,000 Ultimate Reward points to the Hyatt Gold Passport program. 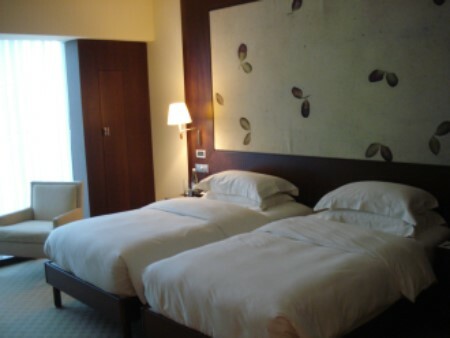 The points have since devalued and it now costs 30,000 points per night for the Park Twin room we had. We were greeted promptly and assisted immediately at the desk. The desk clerk then escorted us to our room and showed us how to work the lights and the thermostat. It sounded basic enough as she explained it but we did have to play around with it a bit to get the hang of things! The room was pretty spacious at 387 sq. ft. (36 sq. m.). In addition to our large twin beds we had a desk with chair, a small credenza with a flat panel TV on top, a small vanity with a lighted mirror as well as a small bar area with the safe. 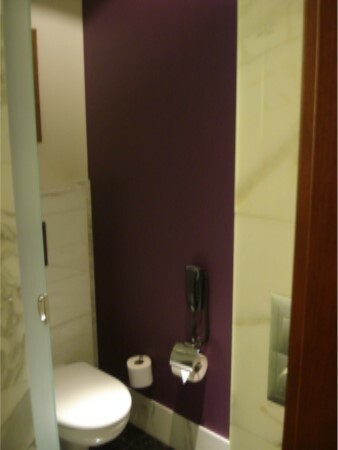 As is typical in many hotel rooms, the bathroom was immediately accessible when coming in from the hallway. The toilet had a small room to itself with an opaque, textured, sliding glass door. 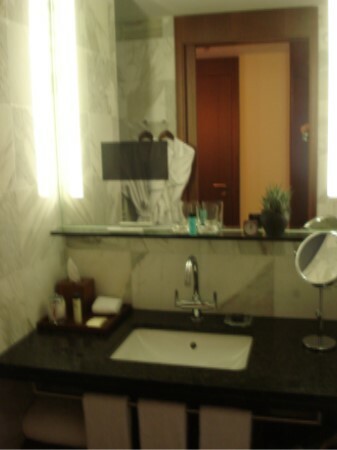 The bathroom vanity was large and had a small TV embedded in the mirror over the sink. There was no door between the vanity area and the tub & shower area but the showerhead was far enough away from the door that water splashing into the vanity area wasn’t really an issue. 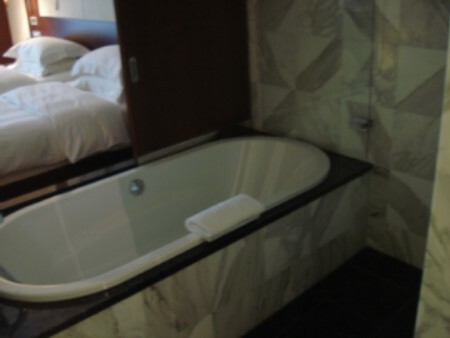 The tub was quite large and the wall beside it was actually wooden, sliding panels that opened up into the bedroom. A little awkward if you’re staying with a friend and not a romantic partner! Fortunately the panels fit together snugly so there were no embarrassing moments between friends. The large showerhead was not over the tub but in the far corner of the room. It wasn’t directly overhead but on the wall. I know a lot of people love overhead rainforest showers but personally I prefer ones that pound down on me like a constant mini-massage. This shower didn’t do that but neither was it so soft that I had a hard time getting the shampoo out of my hair. 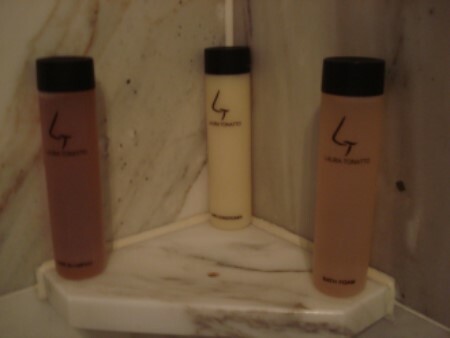 The bath products were Laura Tonatto and the scents were made especially for the hotel. I really enjoyed the hair products and brought them home to finish off the bottles. I wasn’t crazy about the scents of either the hair or bath products. Just a bit too “perfumey” for my personal taste. Two bathrobes were provided. I’m somewhat tall for a woman and these fit me fine. A larger person would have trouble with the robe but I’m told that larger sizes are available for the asking at the desk. A couple of things I almost always have trouble with in other countries are the bedding and the thermostat. At home I like a sheet, a light blanket and a comforter. I can sleep with that setup all year-round and throw covers on or off as needed during the night. Here (and on the river cruise as well) there was a fitted sheet and a duvet. It’s great that the duvet cover can be easily changed between guests but a top sheet would have been most welcome. Since we couldn’t turn the thermostat down as low as we wanted we were constantly throwing the duvet off and then pulling it back on. Really, hotel designers, let middle-aged women tell you how cool the room needs to be at night! 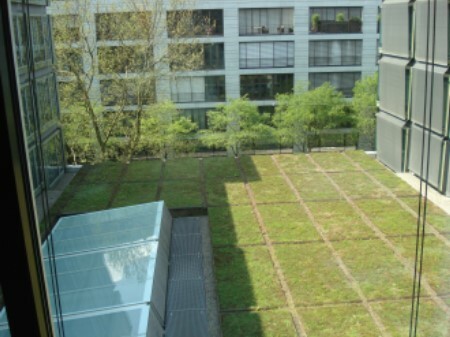 Most people I know prefer to sleep in a cool room and then they don’t mind the heavier covers – but nobody likes to wake up in a pool of sweat in the middle of the night. On our last night we walked back from our Italian dinner and felt we’d walked off enough calories to indulge in one last dessert for the trip. We went to the cafe area in the lobby and browsed the menu. Naturally we were hoping for chocolate melting cake again but did not see it on the menu. However our excellent waiter started describing a chocolate dish to us and soon we knew he was describing exactly what we wanted. One last round of cake and ice cream for the trip! The staff was fantastic and the location made it easily accessible. It was in a very quiet neighborhood and inside was peaceful as well. 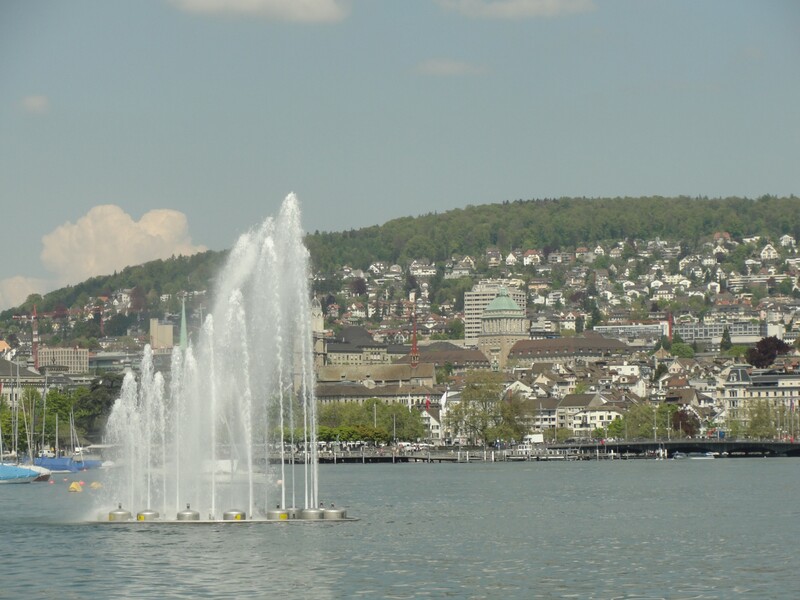 I wouldn’t hesitate to return on my next trip to Zurich. The Viking cruise officially ended in Basel, Switzerland on a Thursday. I wasn’t in any hurry to get back just to save a vacation day, so my cruise roomie and I decided to extend the trip through Saturday. We took the train from Basel to Zurich, which is about an hour away. The Viking concierge arranged a taxi for us and one was waiting for us at their terminal at the appointed time. I don’t recall the price but it was very reasonable. Inside the station we didn’t try to use the automated ticket machines but the man at the ticket window was quite helpful and got us the correct ticket we needed. Fortunately there was a train leaving in about 15-20 minutes so we hopped aboard. I finally pulled out some reading material I’d brought for the trip. It was the first time I’d seen it since I packed it up on the plane! This was a terrific choice for getting to Zurich. The ticket cost 32 Swiss Francs or just over $35 USD. Zurich’s main train station is very convenient for tourists. The local trams (on-street trains) are super-convenient and the whole area is very walkable. We picked up tram tickets at the tourist information office in the train station and only had to just walk outside to pick up the tram that would take us near our hotel, the Park Hyatt. We didn’t have to wait long and even lugging/rolling our suitcases (one large case apiece) it was easy enough to get them on/off the tram. Our tram stop was about two blocks away from the hotel. It was an easy enough walk with the suitcases though there was some construction in the area. 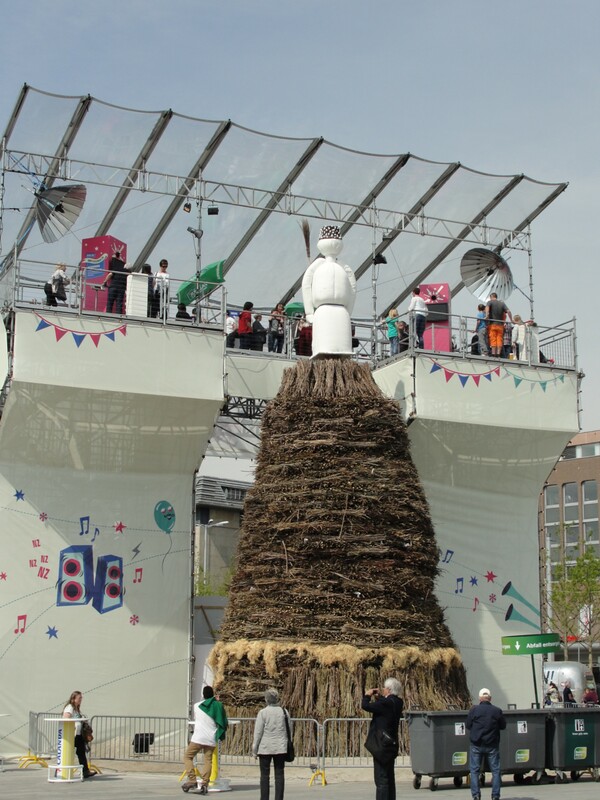 (We have a running joke that we’re going to invest in a scaffolding company in Europe because it seems everywhere we go some building or tourist site is covered up with it!) We walked a couple of blocks and then couldn’t find street numbers though we knew we were close to the hotel. As we chatted about it on the street corner, a local asked what we were looking for and then indicated we were right across the street from it! The signage was so subtle that it was easy to miss during the daytime. At night the sign was lit and easier to see. More on the hotel itself in the next installment. 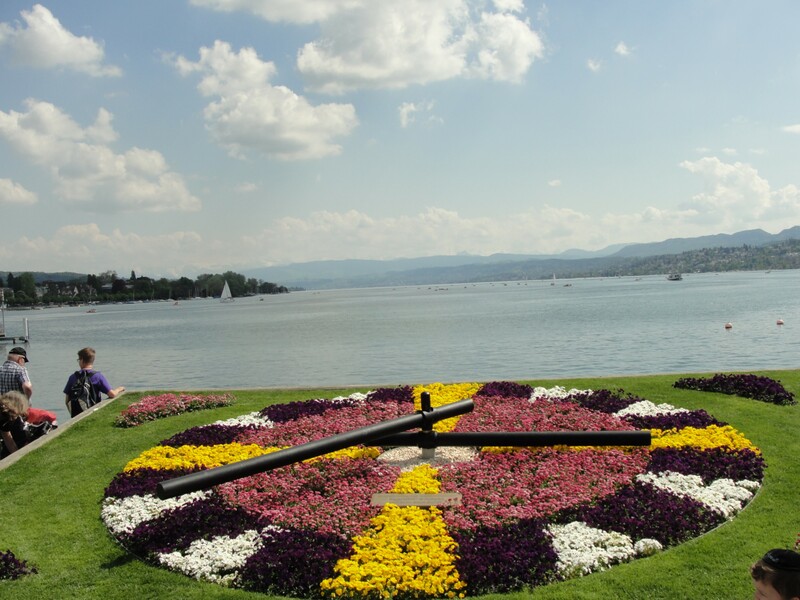 It was a gorgeous day and we ended up near Lake Zurich. We enjoyed just walking through the park there and sat for a bit enjoying the sunshine and the water. There’s a small aviary there and we looked at the various birds housed there. We passed through the souvenir stands and wandered around looking at the architecture and some of the older buildings. After awhile we decided it was nap time and headed back to the hotel. While we never felt we had to rush while on the ship, we were glad to have some extra rest time. That evening we wandered out again for dinner. We took the tram down to the train station and then meandered around the city from there. It was a lovely evening and we found a delightful cafe, Cafe Kranzlin. The food was quite good and the dessert…well. Our one “complaint” (and it wasn’t a serious one) about the food on the river cruise was that there was no chocolate melting cake available. We even talked to Chef Imre and he said that while that dessert was offered on some of the longer cruises, it was not offered on ours. 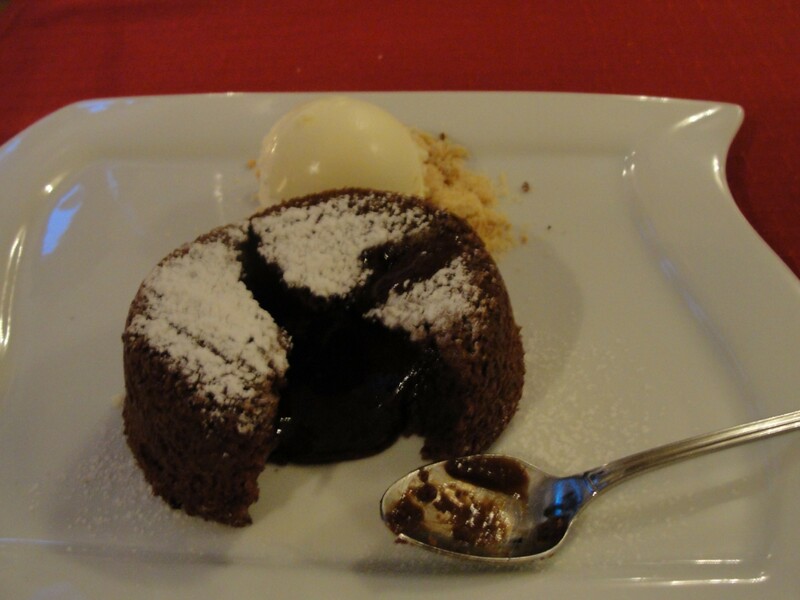 We’d had it before on a Mediterranean cruise and just loved the chocolate cake with the warm melted chocolate center. We’d had it several times during that earlier cruise and were looking forward to it again so we were disappointed when it wasn’t available. But Cafe Kranzlin had it! It was called by a different name but it was just as good. It was so good we had to send a photo back to our friends who had just landed back in the States. They were jealous! 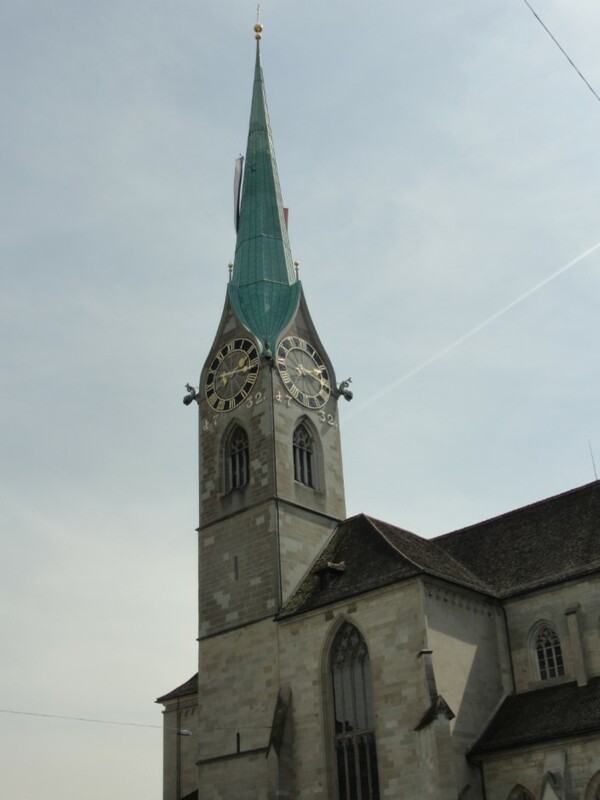 One thing we’d read about, and found to be absolutely true, was that Zurich is a pretty expensive town. Dinner with dessert, regular water to drink, no alcohol plus tip (a reasonable one this time!) – this came out to over $50 USD. Just something to keep in mind if you plan on visiting. But it was the perfect way to top off our first day in Zurich. We headed back to the hotel prepared for a good night’s rest.